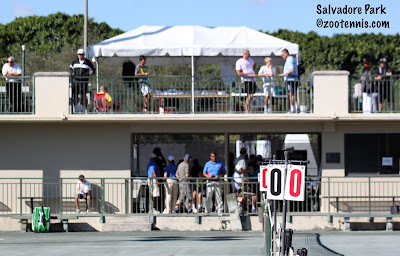 The Tennis Recruiting Network posted my written recap of the 2012 Junior Orange Bowl on Friday, and over the weekend I finished my visual recap, in the usual form of a slideshow and videos. Due to the boys and girls 12s finals being played at different locations at the same time, the boys 12s videos were taken at both the semifinals and the finals. The videos of the champions are embedded below, preceded by the slideshow of the top 6 finishers in each division. The videos of the finalists can be found at the TennisKalamazoo YouTube channel, or by clicking on their names. First, I want to make clear that I am not in Arizona for the Winter Nationals (If my stories don't have a dateline, I am not at a tournament.) I have never been to those particular tournaments, because I can't fit them in my schedule after the Eddie Herr-Orange Bowl-Junior Orange Bowl marathon I run between Thanksgiving and Christmas. I did receive an eyewitness account today from someone at the Mitch Stewart - Gage Brymer round of 16 match in the boys 18s , along with the above photo, and am happy to pass it along. Stewart, a 17 seed, who as a junior in high school has already made a verbal commitment to Washington, beat UCLA recruit and No. 2 seed Brymer 7-6(5), 1-6, 6-3. It was definitely the match of the tournament so far. Brymer jumped out to a 2 break lead in the 1st set winning the first 14 points of the match. Stewart put in the hard yards and scrambled his way to 7-6(5) win. He is an amazing scrambler and fighter. Brymer won the 2nd set relatively quickly 6-1. In the 3rd, Brymer started making some errors and Stewart continued to run down everything. Brymer saved 2 match points serving 2-5, but Stewart served it out winning at love. The TennisLink site for the 12s and 14s is here; the TennisLink site for the 16s and 18s is here. I have begun the daunting task of getting through all my tennis related feeds from the past six weeks, and I've run across a several interesting items. Chris Oddo, writing for USA Today, caught up with Brian Baker, who will be playing in Brisbane, Auckland and in the Australian Open for the first time as a professional (he played in the Australian Junior Championships in 2002 and 2003). Baker spent his off-season training in three different places: Nashville, with Todd Martin in Ponte Vedra, Florida and also at Saddlebrook. Liam Broady of Great Britain, who reached the finals of the 2012 US Open boys championship, is aging out of junior competition, and he was the subject of this feature by BBC Sport. Broady talks about his goals for 2013, the difficult transition from juniors to "seniors", and the lack of pressure he now feels due to the advancing age of most of those in the Top 100. There is also a sidebar on the ATP's top-ranked teenagers, none of whom are in the Top 200. The NCAA announced a long list of likely changes to its recruiting rules earlier this month, which would put all sports on the same recruiting calendar and end restrictions on the forms of communication between a coach and a perspective student-athlete. It appears to be an attempt to allow a coach and a student-athlete to have a better opportunity to learn about each other, and also to eliminate many of the thousands of petty rules that compliance offices spend the bulk of their time monitoring. The complete list is available at NCAA.org. The vote is set for January 19th in Grapevine, Texas. 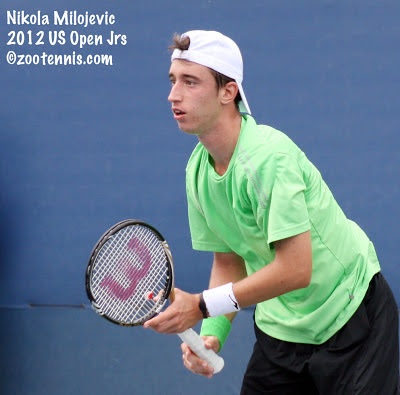 Fifteen-year-old Belinda Bencic of Switzerland and 17-year-old Nikola Milojevic of Serbia won the singles titles Saturday at the ITF Grade A Abierto Juvenil in Mexico City, the first big tournament of 2013 on the ITF schedule. Both had impressive runs on the clay, neither losing a set, and top seed Bencic won six of her 12 sets by 6-0 scores. In the final, Bencic beat No. 2 seed Ching-Wen Hsu of Taiwan 6-4, 6-2 after demolishing No. 3 seed Elise Mertens of Belgium 6-0, 6-0 in the semifinals. No. 2 seed Milojevic, who didn't play the Eddie Herr or the Orange Bowl this year, didn't lose more than four games in any of the 12 sets he won, and in the final, he defeated No. 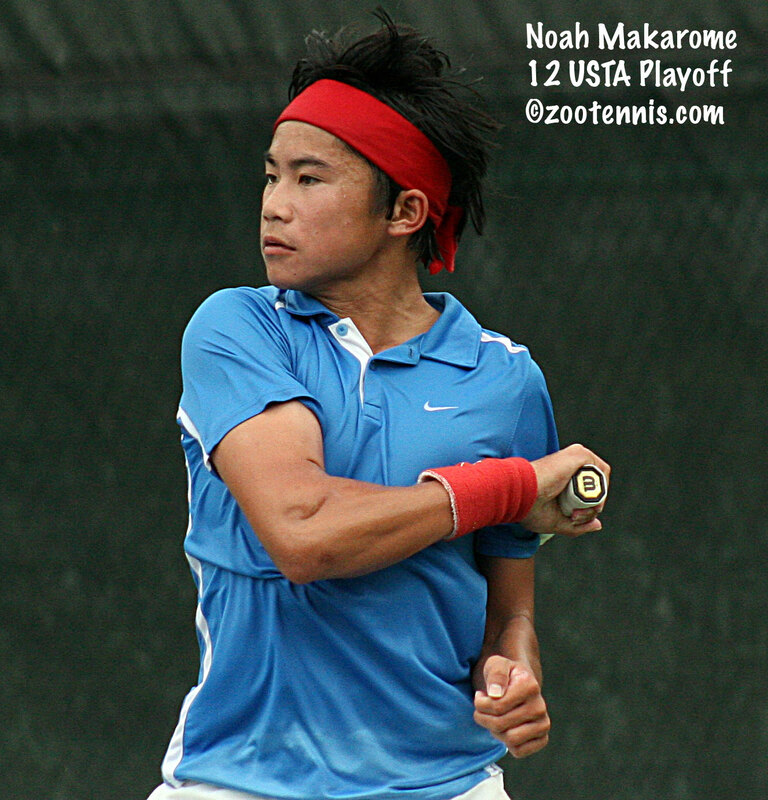 12 seed Naoki Nakagawa of Japan 6-0, 6-3. Nakagawa had surprised top seed Frederico Silva of Portugal 6-4, 4-6, 7-5 in the quarterfinals. Milojevic and Silva won the doubles title as the top seeds, beating No. 2 seeds Franko Miocic of Croatia and Guillermo Nunez of Chile 7-5, 6-3. The girls doubles title also went to the top-seeded team, with Mertens and Karin Kennel of Switzerland defeating Bencic and Veronika Kudermetova of Russia, the No. 2 seeds, 6-4, 7-6(3). For complete results and draws, see the ITF junior website. At the USTA Winter Nationals in Arizona, five of the eight No. 1 seeds are still in the running for a gold ball. George Goldhoff, No. 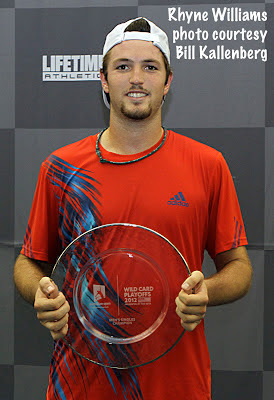 1 in the boys 18s, and Jamie Loeb, the defending champion and No. 1 in the girls 18s, have advanced to Thursday's round of 16. Top boys 16s seed Sameer Kumar has also advanced to the fourth round, but girls 16s No. 1 Meredith Xepoleas lost to unseeded Angela Kulikov in Saturday's third round 7-6(3), 6-4. Both top seeds are out in the 14s, with Connor Hance a late withdrawal and Elizabeth Porter losing in the third round to Hanna Chang, a No. 17 seed. Junior Orange Bowl 12s champion Abigail Desiatnikov is playing the 14s division in this tournament, and as the No. 8 seed, she has reached the quarterfinals, beating Eddie Herr champion Ellie Douglas, a No. 17 seed, 6-1, 6-1. Douglas had beaten Desiatnikov 6-1, 6-3 in the semifinals at the Eddie Herr. Because two matches per day are scheduled during the first two days of the tournament for their age groups, the 14s and 12s are now at the quarterfinal stage. Both No. 1 seeds in the 12s--Keenan Mayo and Sophia Edwards--have advanced to the final eight. For the complete draws, see this TennisLink site for the 12s and 14s, and this TennisLink site for the 16s and 18s. My recap of last week's Junior Orange Bowl is now available at the Tennis Recruiting Network. With my travel and the holiday, I haven't had the time to put together the slideshow or the videos from that tournament, but I hope to have time to devote to those tasks this weekend. 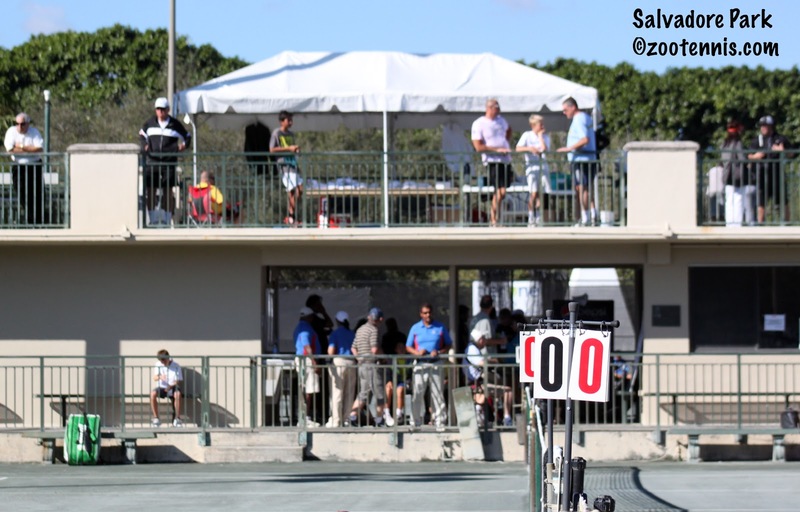 The USTA just had two Town Hall "Listening" meetings regarding the junior competition changes passed in March at the Winter Nationals in Arizona, and Lisa Stone at Parenting Aces posted a recap of Wednesday and Thursday's meetings. Unlike the meeting I attended at the ITA Coaches Convention in Naples, where many of the participants seemed unaware of most of the changes and had little to say about the possible implications, Lisa reports much more direct confrontation. Steve Bellamy and Antonio Mora have made no secret of their opposition, and they both spoke against the changes. The next scheduled meeting is in Atlanta, at the USTA Southern section's annual meeting January 13th. Southern is the only section to vote against the changes at the USTA's semi-annual meeting in March. If you are unable to attend the meeting, or the others scheduled in the Texas, Midwest or Southern California sections, you can still voice your opinion by sending an email to: LetUsKnow@usta.com. It's the season for switching country allegiance, I guess, and it's not just Nicolas Jarry (USA to Chile) and Jesse Levine (USA to Canada). An anonymous commenter pointed out that fourteen-year-old Maria Shishkina, who previously played under the USA flag, but never represented the US in any ITF junior team competitions, is now representing Kazakhstan. Unlike many players now representing that oil-rich country, Shishkina is actually from there. The acceptances for the Australian Open Junior Championships, which run from January 19-26, have been posted, with three US boys and four US girls currently listed in the main draw. Thai Kwiatkowski, Mackenzie McDonald and Martin Redlicki are the boys entered; the girls are Sachia Vickery, who did not play the Orange Bowl due to a back injury, Christina Makarova, Allie Kiick and Jamie Loeb. The Americans in qualifying as of now are Luca Corinteli, Michael Mmoh, Jared Donaldson, Katrine Steffensen and Caroline Doyle. Interesting to note that Nicolas Jarry, who played under the USA flag in 2012, including at the just completed Orange Bowl, is now listed as representing Chile. The most surprising entry in the girls draw is Yulia Putintseva of Kazakhstan, who is now 106 in the WTA rankings. It's most unusual for someone with a ranking that high to play the juniors. She may yet withdraw of course, but the most obvious reason for a junior girl to play a slam so late in her career, the WTA age restrictions, doesn't apply, since she turns 18 on January 7. She has reached two junior slam finals--the US Open in 2010 and the Australian Open in 2012--but has yet to win one. Jeff Sackmann of the Heavy Topspin blog investigated the number of challengers in the first quarter of 2013, and the decline he documented makes for some alarming reading. For me, one of the most persistently puzzling facets of the sport of tennis has been its lack of adjustment for inflation in the prize money offered at lower level events. As Magnus Norman mentioned in the question and answer session I did with him earlier this month, many of the Futures tournaments that offered $10,000 in prize money in 1990 still offer that same amount 22 years later, when just keeping up with inflation alone would require prize money to be over $17,000 now. Those who are able to graduate from the Futures circuit quickly could rely on the more generous prize money offered at the Challengers, but if those are opportunities are disappearing, the possibility of earning a viable living from playing the game might be going with them. The player No. 150 on the PGA's 2012 money list is Nick O'Hern, who made $489,375. The player No. 150 on the ATP's 2012 money list is Joao Souza, who made $176,662. This may be the golden age of men's tennis, but those numbers suggest it may only be so at the very top. The junior tennis calendar doesn't pause for any holidays, with the first ITF tournament of 2013, the Grade A Abierto Juvenil in Mexico City, taking place this week, and the USTA Winter Nationals in Arizona beginning on Thursday. Three Americans have reached the quarterfinals in Mexico: 14-year-old qualifier Francis Tiafoe, No. 7 seed Martin Redlicki and unseeded Marie Norris. Tiafoe has already beaten two seeds--No. 10 seed Jaime Galleguillos, and today, No. 3 seed and ITF world No. 57 Franko Miocic of Croatia. Next for Tiafoe, the last unseeded player remaining, is No. 6 seed Lucas Gomez of Mexico. Redlicki will play No. 4 seed Clement Geens of Belgium in the quarterfinals Thursday. Norris, the 16s Eddie Herr champion, also has beaten two seeds en route to the quarterfinals, today picking up a three-set victory over No. 10 seed Harriet Dart of Great Britain, after a second round win over No. 7 seed Laura Ucros of Colombia. She will play No. 2 seed Ching-Wen Hsu of Taiwan on Friday. Top seed Frederico Silva of Portugal and Belinda Bencic of Switzerland have reached the quarterfinals. The ITF Junior website has been down all day, but draws are available at the tournament website. The USTA Winter Nationals begin Thursday and end on January 2, 2013. The boys and girls 12s and 14s are in Tucson, and the boys and girls 16s and 18s are in Scottsdale. Draws are available at the TennisLink sites, with the 12s and 14s here, and the 16s and 18s here. I'll be taking a couple of days off to travel back to Michigan and spend time with family, but here's a few links to check out if you have a moment to spare during the holiday festivities. I've promoted my question and answer session with Magnus Norman several times on twitter, and once again would like to mention it here. For anyone with an interest in player development, it's an opportunity to hear a thoughtful take on important issues by the former Swedish great, who has now his own academy in Stockholm. The New York Times' Karen Crouse was at the Orange Bowl in Plantation for this article on World No. 1 Junior Taylor Townsend as she takes the first steps toward a professional career. And to give commenter Austin a Christmas present, here is a Yahoo Canada article about Jesse Levine's decision to change his tennis nationality from the United States to Canada. For a historical perspective, the TennisSpace website has compiled a list of the Top 10 allegiance switchers. Two Americans—one a veteran and former champion, the other a rookie—joined Great Britain’s and Israel’s first-time winners on a crisp and cloudless final day at the 51st Junior Orange Bowl International 14s and 12s Championships. Top seed Michael Mmoh of the United States, the 2010 boys 12s champion, defeated No. 6 seed Marko Osmakcic of Switzerland 6-4, 7-5 in the boys 14s final, while 11-year-old Abigail Desiatnikov, competing in her first Junior Orange Bowl, won a similarly tight battle with Dayana Yastremska of Ukraine 7-5, 7-5. Both Desiatnikov and Yastremska were No. 1 seeds. No. 8 seed Maia Lumsden, another first-time Junior Orange Bowl participant, picked up Great Britain’s first girls 14s title, defeating compatriot Gabriella Taylor, a No. 17 seed, 6-3, 7-5, and Yshai Oliel, a No. 1 seed collected Israel’s first boys 12s title with a 6-3, 6-1 victory over Aruba’s unseeded Patrick Sydow. 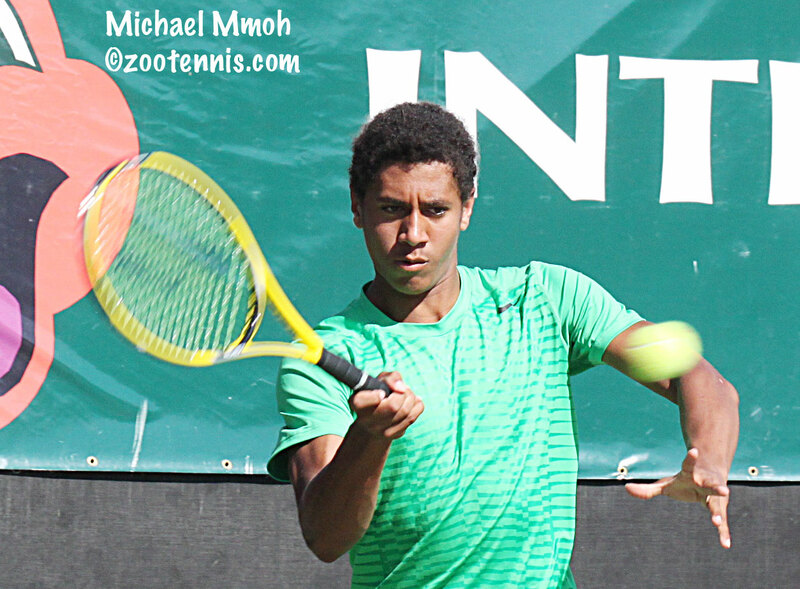 Mmoh took a quick 5-1 lead in the first set, but there would be no repeat of his 6-2, 6-0 win over Osmakcic in the ITF World Junior Tennis 14-and-under competition back in August, with Osmakcic winning three straight games before Mmoh closed out the opening set. Osmakcic, hitting the ball with pace and depth, kept Mmoh on the defensive, and got an early break in the second set, building a 5-2 lead. Serving for the set at 5-3, Osmakcic was two points from forcing a third set at 30-0, but Mmoh raised his level, hitting a perfect backhand pass to get a break point, and then converting it, with a big return of a good first serve forcing Osmakcic to net a backhand. Once Mmoh held for 5-5, hitting an ace on game point, he could see the finish line. Mmoh broke in the next game, hitting another brilliant backhand pass, this of the dipping cross court variety for 15-30, and then waited for Osmakcic to unravel, which he did, netting two forehands. Serving for the match, Mmoh gave his opponent no hope, cracking an ace for 30-0, then getting another forehand error from Osmakcic to reach match point. He missed his first serve, but hit a wicked kicker on his second, and Osmakcic couldn’t get his return back in play. Mmoh, who won all seven of his matches in straight sets and was truly tested for the first time in the final, wasn’t pleased with his performance early in the second set, but he gave credit to Osmakcic for that lapse. With his second Orange Bowl title secure, Mmoh could reflect on the meaning of his first, two years ago, as a wild card. Next for Mmoh is the Australian Open Junior Championships, and whether he’ll try for the Orange Bowl 16s title next year depends on how he performs in the big events in the ITF Juniors in 2013. Desiatnikov made her first appearance at the Junior Orange Bowl a winning one, capping a successful Florida swing with a title, after a semifinal appearance at the Eddie Herr and a trip to the finals at the Nike Junior Tour International Masters. Desiatnikov and Yastremska blasted the ball from baseline to baseline, but it was the diminutive native of Ohio who performed best in the late stages of both sets. Neither girl was able to defend her serve as six of the first eight games went to the receiver. At 5-5 in the opening set, Desiatnikov fell behind 0-30, but won the next five points, then broke Yastremska at love to take the first set. The second set played out much like the first, with five straight breaks until Yastremska held for a 4-2 lead. Double faults plagued both girls, but once the rallies began, the fans in the University of Miami stands were treated to some entertaining tennis and more “davais” than you could count. Desiatnikov, who is of Russian heritage and says she speaks a little of the language, said she recently made a new Russian friend who doesn’t speak much English, so it seemed natural to start exhorting herself in that language this week. Yastremska, who has the power to blow past opponents, couldn’t outhit Desiatnikov, nor could Yastremska hold her 4-2 second set lead. But when she broke Desiatnikov again at 4-4, the 12-year-old Ukrainian served to send the match to a third set. She never got to set point, with Desiatnikov holding steady, while Yastremska made a few key forehand errors. After Desiatnikov held for 6-5, Yastremska was under pressure and her forehand couldn’t survive it. She missed two and, at match point, netted a third to give an obviously delighted Desiatnikov the victory. As a reward for winning the tournament, Desiatnikov will travel to the USTA Winter Nationals, which begin on Thursday in Tucson, Arizona, to play in the 14s division. "Last year I didn't play Arizona Super Nationals, I went and had Christmas," Desiatnikov said. "Me and my parents had a deal--because they wanted to do Christmas, but I wanted to go (to Arizona)--that if I won this tournament, we'd go to Arizona." As for a more immediate celebration, Desiatnikov said, "I can't wait to eat an orange." The emotion and energy that surrounded the girls 12s final didn't spill over to the next court, where two longtime friends and current roommates Lumsden and Taylor engaged in a battle to be the first British girl to win a Junior Orange Bowl 14s title. Both girls are low-key and business-like on the court in a normal competitive setting, so the added emotional circumstances only added to the subdued nature of the match. Lumsden took the first set, handling her nerves and using her different spins and placements to keep Taylor out of sync. In the second set, it was Lumsden who couldn't get all the parts of her game clicking, and she fell behind 4-1, before she regained her equilibrium and took the next four games. Serving for the match at 5-4, Lumsden had two match points, but unforced errors kept her from closing it out. Taylor couldn't hold in the next lengthy game however, with two double faults back-to-back contributing to Lumsden's opportunity to serve it out a second time. Again Lumsden got to the brink, getting to 40-15 only to commit two more unforced errors. After a Taylor backhand went just long, Lumsden reached match point No. 5, and this time it was Taylor who made the error, netting a forehand to give Lumsden the title. "Especially in the first set, I was moving the ball around well, using the whole court--short, deep, wide," said Lumsden in her Glasgow, Scotland brogue. "I lost my focus a bit in the second when I went down 4-1, but then it was nice to get it together and come through." Lumsden, who is staying in the same hotel room with Taylor this week, admitted that playing her best tennis was difficult under the circumstances. "It was, especially because I know her so well and everything," said Lumsden. "It's really hard to play against someone like that. I've pretty much traveled with her the whole year. We've been on the winning Summer Cup team together, so yeah, it was tough." As for the distinction of being the first British girl to win the 14s title, Lumsden was pleased she could fight through the difficulties an all-British final presented and put her name on the long list of winners. "I knew it was going to be a tough match," Lumsden said. "I'm glad it's me." In the boys 12s final, played on the Har-Tru courts of Salvadore Park, Oliel became the first boy from Israel to capture the Junior Orange Bowl 12s title with a 6-3, 6-1 win over Patrick Sydow of Aruba. Oliel, a left-hander with both power and touch, dropped only one set in his march to the final, and said he had that history in mind when he stepped on the court this morning. "I feel very excited and up to play the Orange Bowl and to take the tournament," said Oliel, who is a product of the David Squad, a non-profit program for development of Israeli tennis. 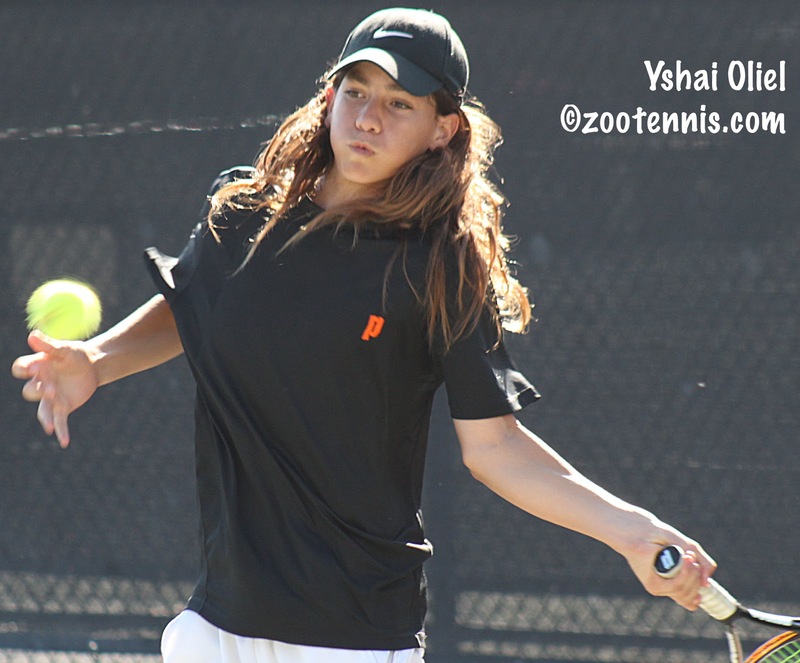 Oliel, who joins Shahar Peer, the 2001 Girls 14s champion, on the list of Israeli Orange Bowl winners, stayed with a South Florida family, who also supplied support for him at all his matches. "Today I played very good," said Oliel, who will play Les Petits As in France next month. "I hope to play like this every day." How big is Oliel's Junior Orange Bowl title in Israel? According to IsraeliTennisResults.com, Oliel received a congratulatory phone call from prime minister Benjamin Netanyahu. 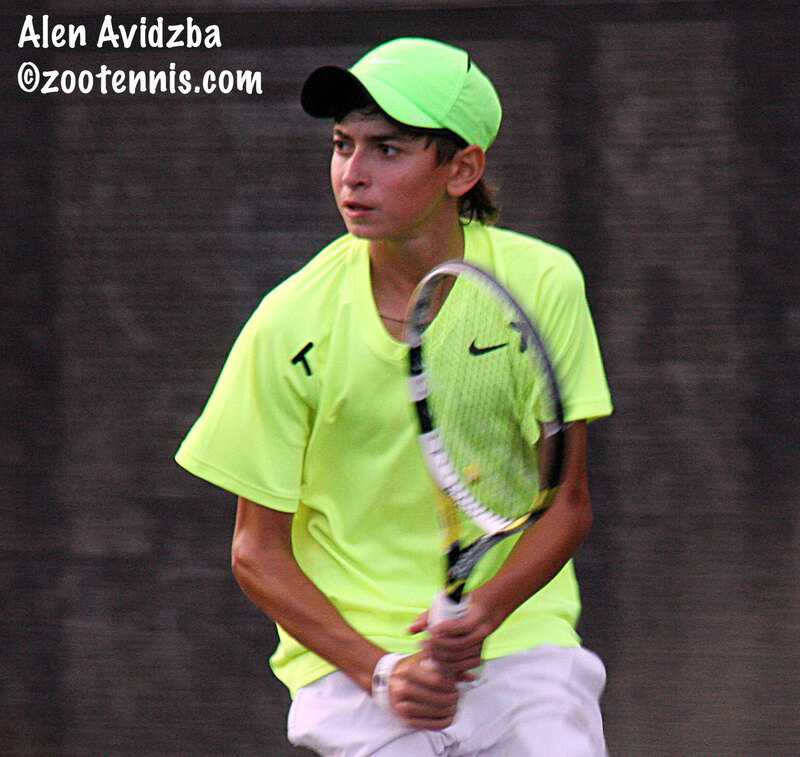 In boys 12s, third place went to Nicolas Mejia of Colombia, who defeated Igor Gimenez of Brazil 6-3, 6-3. Chen-Jui Ho of Taiwan took fifth place with a 6-3, 0-6, 6-2 win over Naoki Tajima of Japan. In girls 12s, Katarina Zavatska of Ukraine defeated Nada Dimovska of the US 6-4, 6-4 for third place, and Ellie Douglas of the US took fifth place with a 6-1, 6-4 victory over Nicole Conard, also of the US. The boys 14s third place trophy went to Mikael Ymer of Sweden, who beat Nathan Ponwith of the US 1-6, 7-6(3), 6-1. 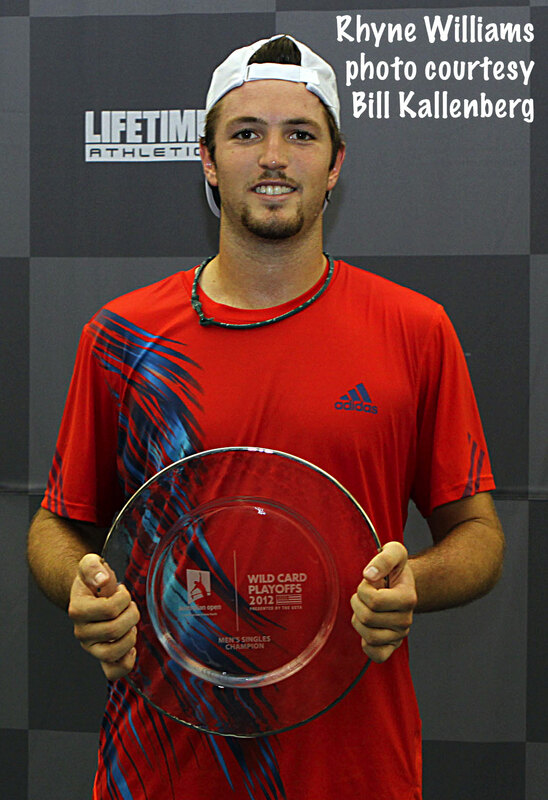 Oliver Anderson of Australia took fifth with a 6-4, 6-1 victory over India's Basil Khuma. Fanni Stollar of Hungary took third place, given a walkover by Theo Gravouil of France. Nicole Frenkel of the US finished in fifth place with a 4-6, 7-6(6), 6-4 win over Sofia Kenin, also of the United States. Michael Mmoh of the US already has one Junior Orange Bowl title, winning the 12s championship in 2010. Sunday morning he will take aim on a second title, this time in the 14s, against No. 6 seed Marko Osmakcic of Switzerland. Top seed Mmoh has yet to drop a set in tournament, but he played his best match of the tournament Saturday, defeating No. 3 seed Nathan Ponwith, also from the United States, 6-0, 6-2. Mmoh had two previous wins over Ponwith, the last one in the semifinals at the Aegon Teen Tennis tournament in the Great Britain in January, and again Ponwith had no answers for Mmoh's strength and power. "He was really tight coming in," said Mmoh, who has yet to surrender more than four games in a set this week. "I was loose, and I don't think he's been in these kind of situations. It was just mental really. He's a really good player, but he just didn't come out strong." Mmoh has been playing 18s successfully this fall, qualifying for the US Open Junior Championships and winning a round there and also reaching the quarterfinals at the Grade A Osaka Mayor's Cup in Japan in October, so playing in the 14s now comes with a different set of expectations. "Coming into this tournament, I really wanted to win this tournament, that was my goal," said Mmoh, who trains at the IMG Bollettieri Academy in Bradenton. In the 18s, usually my goal is like quarters, but this, my goal was to win it." Mmoh said he's frequently asked if his goal is to win every age division of the Orange Bowl, and in hindsight thinks perhaps he should have played the 16s at the Orange Bowl in Plantation, rather the 18s, where he lost in the first round to eventual champion Laslo Djere of Serbia. Osmakcic, who defeated No. 4 seed Mikael Ymer of Sweden 6-1, 3-6, 6-2 in Saturday's other semifinal, will be looking to avenge his 6-2, 6-0 loss to Mmoh at the ITF World Junior Tennis 14-and-under Team Championships back in August. Eighth seed Maia Lumsden and Gabriella Taylor, a No. 17 seed, both of Great Britain, will meet in the girls 14s final, and that will be a rematch of a much closer previous meeting. Back in May, Lumsden defeated Taylor 3-6, 6-4, 6-4 in the final of a 14s tournament on clay in the Czech Republic. "It was hard, especially because it was in the final," Lumsden said of the three-hour match. "We were both a bit tired, but it was a good match." Neither girl will likely be tired for Sunday's final, as neither has dropped a set in their six victories this week. In their semifinals Saturday, Lumsden took care of Theo Gravouil of France 6-1, 7-6(1), coming back from 5-2 down in the second set, while Taylor cruised past Eddie Herr champion and No. 5 seed Fanni Stollar of Hungary 6-2, 6-0. Lumsden, who has never played the Junior Orange Bowl before, said her belief in the strength of the British contingent grew as the week progressed. "I wasn't expecting it at the beginning, but as the tournament went on, I though that maybe could happen," said Lumsden, of Glasgow, Scotland. "When I got further into the tournament I started playing better, and I could see Gabby was playing well as well, so I had a feeling." Whether it is Taylor or Lumsden collecting the winner's bowl of oranges Sunday, she will be the first girl from Great Britain to take the 14s title. 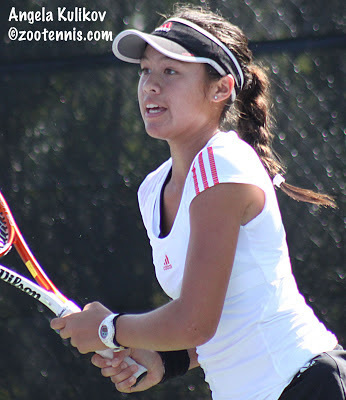 Jessica Ren won the Junior Orange Bowl 12s title in 2006. LTA coach Helen Reesby said there are a variety of reasons for the recent surge in British tennis, both at the professional and junior levels. "We've had a great year throughout, with the 14s particularly very strong, but in general all the way through," said Reesby. "I work for women's tennis, but we have a very strong group of women now, with Laura Robson and Heather Watson and another three girls who are inside or around Top 100, and our juniors are also starting to move that way. I think it's showing we're becoming a very strong tennis nation. We have a good system in place now, we have a new CEO since 2007, when we had quite a big shakeup, and I think we've got the right coaches in the right places, working with the right players." Abigail Desiatnikov is looking to become the third straight American girl to win the 12s title, following Nicole Frenkel and Claire Liu, after her 6-4, 6-3 victory over qualifier Nada Dimovska, also of the US. Desiatnikov trailed 3-0 in the second set, but took the last six games of the match by keeping the ball away from Dimovska's forehand. "All the time she was trying to hit a winner on the forehand," said the 11-year-old from Ohio, who had beaten Dimovska in the second round at the Eddie Herr. "She definitely played better this match. Her forehand was way more lethal. Maybe two she hit not trying to hit a winner, so I was trying to focus more to the backhand." It's Desiatnikov's first time playing the Orange Bowl, and after a semifinal showing at the Eddie Herr and reaching the final at the Nike Junior Tour International Masters the past few weeks, she says she's ready for a title. "I just really, really want to win this tournament," said Desiatnikov. "I really hope to win, and I think I can." Desiatnikov will play Dayana Yastremska of Ukraine, also a No. 1 seed, in Sunday morning's final. Yastremska defeated unseeded compatriot Katarina Zavatska 6-4, 6-1 to set up a rematch of her Eddie Herr quarterfinal defeat to Desiatnikov. "She's very good, hits very hard," said Desiatnikov, who won the match 6-2, 6-4. "She never hits high, except on defense, she hits bam, bam, bam, and that's my game. I love that game. It will be a really good final." The boys 12s final, which will be played at Salvadore Park at 9 a.m., the same time as the girls 12s final at the University of Miami, will feature Yshai Oliel of Israel against Patrick Sydow of Aruba. Sydow, who is unseeded, reached the final with a 6-4, 6-4 win over Igor Gimenez of Brazil, also unseeded. Oliel had a considerably tougher time with unseeded Nicolas Mejia of Colombia, recording a 6-4, 6-7(4), 6-1 victory. Oliel had a vocal band of supporters for the third set, as did Mejia, who trains in Miami. In the first few games of the third set, which were extremely close, those lining the second deck railing above Court 1 made no secret of their affiliation, and the players were both reacting emotionally to each winner or error. When Oliel finally got control of the match, getting a second break to make it 5-1, he was able to close it out without any further drama in a match full of it. 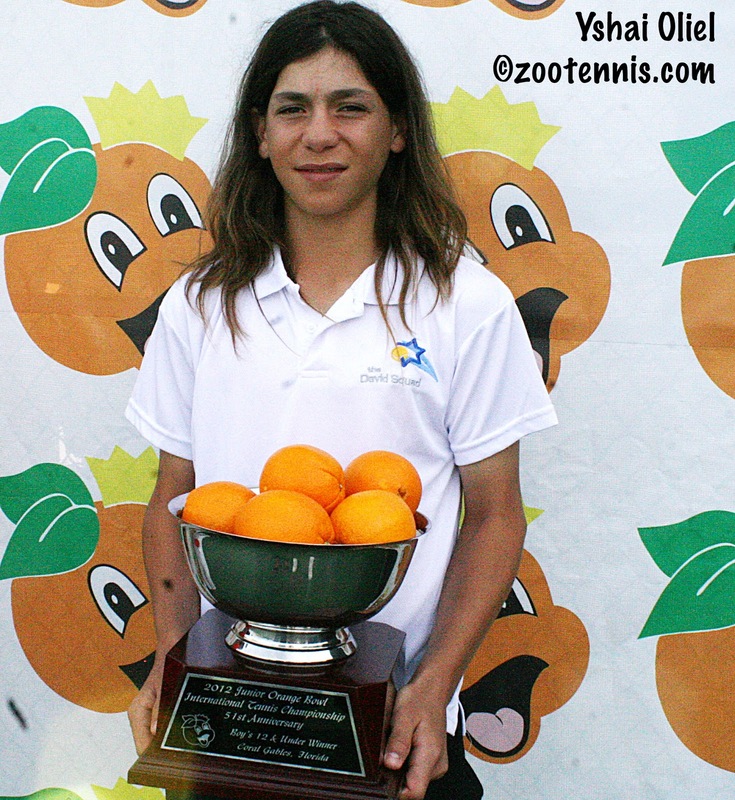 A player from Aruba has never won a Junior Orange Bowl title, and the only player from Israel to win one is Shahar Peer, who took the girls 14s title in 2001. In addition to the singles finals, Sunday will also feature the third and fourth place matches and the consolation final, which will decided fifth place in the tournament. A cold front descended on South Florida overnight, with the gusty winds accompanying the cooler air nearly blowing No. 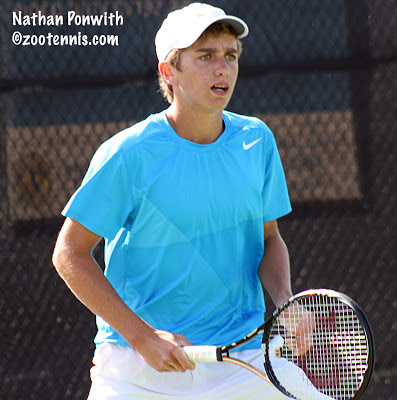 3 seed Nathan Ponwith out of the Junior Orange Bowl boys 14s draw in Friday's quarterfinals. Trailing 5-1 in the third set to Chien Hsun Lo of Taiwan, a No. 17 seed, Ponwith certainly couldn't expect victory, but the 14-year-old from Scottsdale won the final six games of the match for a 6-3, 3-6, 7-5 win. Serving for the match at 5-4 in the third set, Lo earned a match point with a sharply angled cross court forehand winner at 30-30. After pushing Ponwith back behind the baseline, Lo stood at the net, just needing to put away a simple backhand volley to collect the victory. Somehow that volley went into the net, not over it, and two points and two unforced errors later, Ponwith was back even. After Ponwith held for 6-5, Lo had a game point to force a tiebreaker, but his forehand caught the tape for deuce. On the next point, he had Ponwith frozen with a lob, but it drifted long, to give Ponwith a match point. He converted his first and only when Lo sent a forehand long after a brief rally. "It was a lot of luck," Ponwith said of surviving match point. "I should not have won that point. But after coming back and winning that game, I started getting a lot of momentum. Down 5-1, I realized if I didn't change something I was going to lose, so I just tried to make every ball, and when it was there play aggressive." Ponwith, of Scottsdale, Arizona, said he'd been involved in matches with similar comebacks before, but the outcome wasn't what it was Friday. "Sometimes I was on the other end as well," Ponwith said. "It's always tough to have it right there on your racquet. I'm just glad I came back and got through it." Ponwith will play top seed Michael Mmoh in Saturday's semifinal. Mmoh got by a pesky Zeke Clark 6-1, 6-3 to set up a rematch with Ponwith. Mmoh beat Ponwith in the semifinals of the Aegon Teen Tennis tournament in Bolton in January, and before that in the quarterfinals of the Junior Orange Bowl 12s in 2010, which Mmoh went on to win. "I've played him a couple of times and never beaten him," Ponwith said. "He's a very tough player, very athletic, and it's going to be a very tough match for me." The bottom half of the boys draw will feature No. 4 seed Mikael Ymer of Sweden against No. 6 seed Marko Osmakcic of Switzerland. Ymer downed Jay Clarke of Great Britain 7-6(3), 6-3, while Osmakcic ousted No. 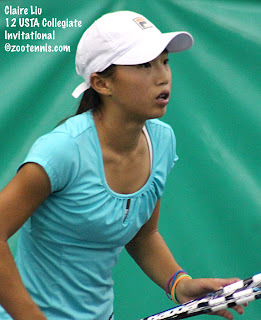 2 seed Chan Yeong Oh of Korea 6-1, 4-6, 6-1. The girls 14s quarterfinals were also played at the University of Miami on Friday, with the British girls leading the way into the semifinals. Gabriella Taylor, a No. 17 seed, beat top seed Dalma Galfi of Hungary 6-3, 6-1, and Maia Lumsden, the No. 8 seed, was even more impressive in her 6-1, 6-1 win over unseeded Nikolina Jovic of Serbia. Taylor will play Eddie Herr champion Fanni Stollar of Hungary, the No. 5 seed, who recovered from a rough start to beat CC Bellis of the US, a No. 9 seed, 0-6, 6-1, 6-2. Lumsden will play Theo Gravouil of France, a 6-4, 6-4 winner over Alexis Nelson, a No. 9 seed, of the US. In the girls 12s, an American and a Ukrainian will meet in the final, but which one will be decided in Saturday's semifinals at the University of Miami. Ohio's Abigail Desiatnikov, a No. 1 seed, will play qualifier Nada Dimovska of New Jersey in one semifinal, while the other will feature No. 1 seed Dayana Yastremska against unseeded Katarina Zavatska. Desiatnikov defeated Jovana Vukovic of Serbia 7-5, 6-1 in the quarterfinals, and Dimovska got by No. 1 seed Luci Kankova of the Czech Republic 6-2, 6-3. Dimovska has now won eight matches in eight days and has yet to lose a set. She lost to Desiatnikov in the second round of the Eddie Herr last month. Yastremska outlasted Eddie Herr finalist Anastasia Potapova of Russia 2-6, 6-3, 6-3, while Zavatska cruised by qualifier Ulyana Shirokova of the US 6-3, 6-0. There are three unseeded players and no Americans left in the boys 12s draw, after Brazil's Igor Gimenez defeated Roscoe Bellamy, a No. 1 seed from the US, 7-5, 6-4, and Israel's Yshai Oliel downed unseeded Jenson Brooksby of the US 6-2, 6-1. Gimenez will play Aruba's Patrick Sydow, also unseeded, in one semifinal, with Oliel playing unseeded Nicolas Mejia of Colombia, who lives and trains in Miami. Mejia surprised Nike Junior Tour International Masters champion Rudolf Molleker of Germay 1-6, 7-6(0), 6-4. Sydow picked up a 6-3, 6-4 quarterfinal victory over unseeded Mischa Lanz of Switzerland. The girls 12s and 14s semifinals are scheduled for 10:00 a.m.on Saturday at the University of Miami courts, with the boys 14s following around 11:30. The boys 12s semifinals at Salvadore Park will begin at 11:30 a.m. I didn't think I would have time to put this together until later this month, but the days between the two Orange Bowls gave me an opportunity to transcribe my Orange Bowl interview with former Swedish star Magnus Norman. Norman has founded, along with Nicklas Kulti and Mikael Tillstrom, the Good to Great Tennis Academy in Stockholm, and had some interesting answers to my questions about player development, coaching philosophy and the decline in Swedish tennis. Good to Great has also recently begun working with Grigor Dimitrov of Bulgaria, and Norman addressed the challenges faced by those, like Dimitrov, who are singled out for pro success at an early age. The entire interview can be found today at the Tennis Recruiting Network. 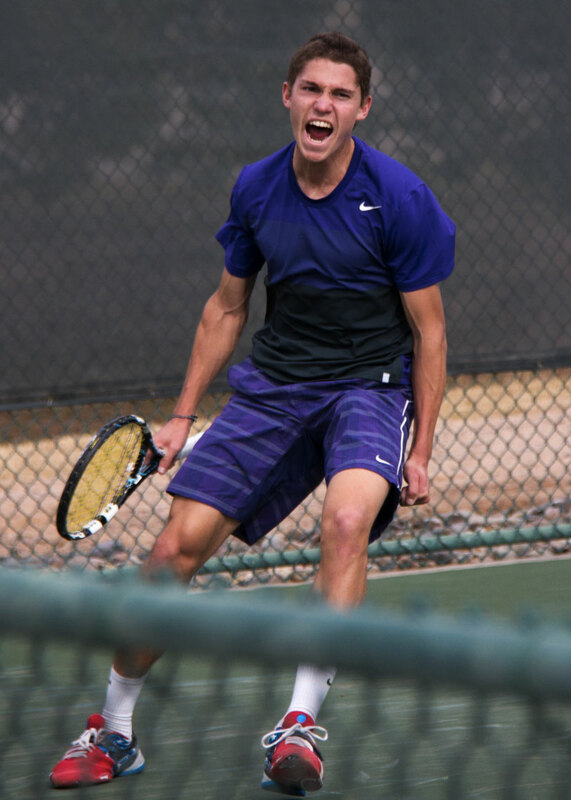 Special thanks to TCU men's coach David Roditi and Junior Tennis Champions Center's Frank Salazar for suggesting I write about Norman's new venture. Since I spoke with Norman, Good to Great has announced a partnership with Finland's tennis federation. Beginning February 1, former USTA National Coach Martin van Daalen will be Finland's head of Player Development, which includes coaching education as well as Finland's Fed Cup and Davis Cup. The quarterfinals are set for Friday at the 2012 Junior Orange Bowl tournament, with some expected and some unexpected players among the final eight in the four divisions. I spent the day at the boys 12s at Salvadore Park, where only three No. 1 seeds remain of the original 16. One of them, Yshai Oliel of Israel, had his hands full with unseeded Brian Shi of the US, who gave the left-hander fits in the second set, coming back from 4-1 down to draw even, only to lose the final two games. Oliel will play unseeded Jenson Brooksby of the US, who reached the quarterfinals when his opponent, Blake Croyder, retired up 6-3, 5-1, 40-15. Croyder, who has family in the Philippines, was flying there for the holidays Thursday night, so his coach told tournament officials prior to the start of the match that he was going to pull Croyder off the court at match point if Croyder reached that stage in the match. Croyder wasn't told of his coach's plan prior to the match, a plan which allowed Brooksby to advance rather than have Croyder give his next opponent a walkover. When Croyder did reach match point, his coach asked the roving umpire to walk out on the court to announce the retirement, and when she did, Croyder didn't protest. Brooksby was understandably in shock when he reported his score to the tournament desk, but he will play in the quarterfinals Friday, and Croyder's backdraw opponent will receive a walkover. Nike Junior Tour International Masters champion Rudolf Molleker, a No. 1 seed, will play unseeded Nicolas Mejia of Colombia, and Roscoe Bellamy, also a No. 1 seed, will face unseeded Igor Gimenez of Brazil. Bellamy defeated fellow No. 1 seed Boris Kozlov of the US 6-4, 6-3. The only three-set match in the boys round of 16 was unseeded Patrick Sydow's 6-7(5), 7-6(6), 7-6(2) win over No. 1 seed Sebastian Baez of Argentina. Baez, at least head shorter than Sydow, twice prevented Sydow from serving out the match in the third set, but he couldn't make that last push in the tiebreaker. Sydow, from Aruba, will play unseeded Mischa Lanz of Switzerland in Friday's quarterfinals. The quarterfinals of the girls 12s still have five No. 1 seeds remaining, as well as two qualifiers. Abigail Desiatnikov of the United States, Jovana Vukovic of Serbia, Lucia Kankova of the Czech Republic, Dayana Yastremska of Ukraine and Anastasia Potapova of Russia are the No. 1 seeds in the quarterfinals, with Ulyana Shirokova and Nada Dimovska of the US the two qualifiers. Dimovska defeated Eddie Herr champion Ellie Douglas 6-3, 6-4, while Shirokova beat unseeded Cherry Kim of Korea 6-0, 6-3. Neither has lost a set in the seven matches each has played in the past seven days. The top six seeds have advanced to the quarterfinals in the boys 14s, with Michael Mmoh(1), Chan Yeong Oh(2) and Nathan Ponwith(3) all winning their fourth round matches in straight sets. Mmoh will meet unseeded Zeke Clark of the US, who defeated his second seed in two days, taking out a No. 9 seed, Nicolas Bacella of Argentina, 6-1, 6-2 today. Ponwith made it three Americans in the top half with a 6-1, 6-3 victory over No. 17 seed Stefanos Tsitsipas of Greece, and he will play Chien Hzun Lo of Taiwan Friday. Oh meets No. 6 seed Marko Osmakcic of Switzerland, and No. 4 seed Mikael Ymer of Sweden faces No. 5 seed Jay Clarke of Great Britain. The girls 14s will move from Crandon Park to the University of Miami for Friday's quarterfinals, with two British, two Hungarian and two American girls among the final eight. Gabriella Taylor of Great Britain, a 17 seed, will play No. 1 seed Dalma Galfi of Hungary, and No. 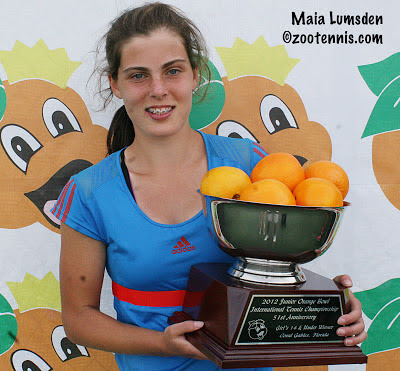 9 seed CC Bellis of the US, a finalist in the 12s Junior Orange Bowl last year, will play Eddie Herr champion and No. 5 seed Fanni Stollar of Hungary. Alexis Nelson of the US, a No. 9 seed, will play Theo Gravouil of France, a 17 seed, and No. 8 seed Maia Lumsden of Great Britain meets unseeded Nikolina Jovic of Serbia. For Wednesday's third round at the Junior Orange Bowl, I decided to concentrate on the boys 14s at the University of Miami. It was another lovely day in South Florida, with few clouds and temperatures again in the low 80s, and even among longtime residents, the mild weather was a popular topic of conversation. 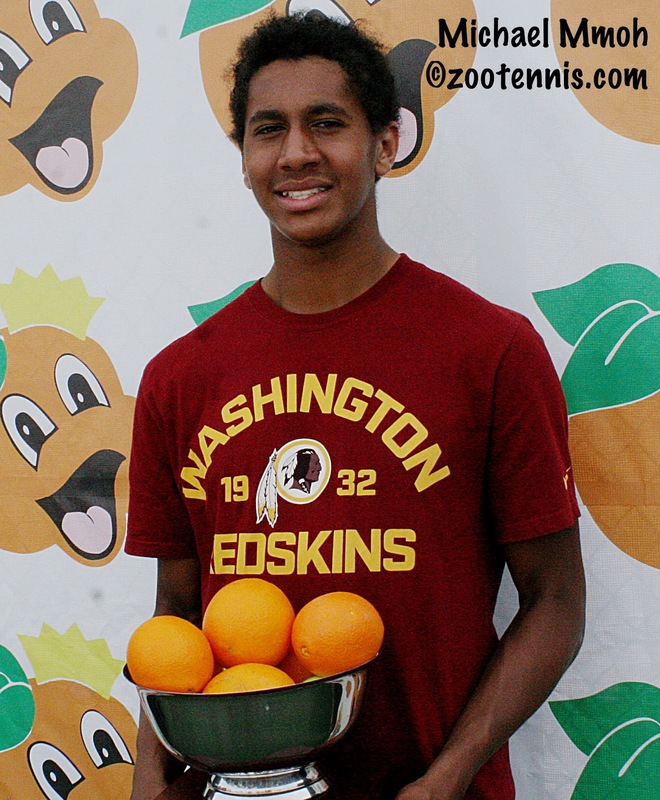 With his ITF ranking of 119, top seed Michael Mmoh of the US, the 2010 Junior Orange Bowl 12s champion, is the overwhelming favorite to take the title this year, and in his first two matches he had lost a total of only two games. Today against qualifier Vince Russell Salas, who is listed in the draw as from the USA and on the ITF Junior site as from the Philippines, Mmoh started as if he would continue on that same dominant path, taking a 4-1 lead in the first set. Salas made too many unforced errors and had difficulty with Mmoh's serve in the first three games, but he shook off his nerves and played much better after that, forcing Mmoh to earn the points he won. Salas got the break back with Mmoh serving at 4-2, and he held to make it 4-4, but serving at 4-5, he committed a costly unforced error on the backhand side at 30-30, giving Mmoh a set point. Mmoh didn't squander it, belting a forehand winner to take the first set. Mmoh struggled on serve in the opening game of the second set, with his strategy of coming forward leaving him vulnerable to Salas' lobs and passing shots, but Mmoh held, then broke, and this time Salas was unable to get the break back. Several line disputes added to the tension, with the roving umpire called to court by each player, and the handshake after Mmoh's 6-4, 6-1 victory was perfunctory at best. Mmoh's opponent in the round of 16 is unseeded Oliver Anderson of Australia, who beat Matthew Gamble of the US, a 17 seed, 6-1, 6-4. Second seed Oh, also playing on Court 1, started poorly and lost the first set to qualifier Daniel Soyfer of the US 6-1, done in by a slew of unforced errors and Soyfer's relaxed start. Trailing 2-1 in the second set, 14-year-old Korean won five straight games, picking up his energy level, which resulted in improved movement. After taking the second set 6-2, Oh didn't let the 10 minute break between the second and third sets rob him of any momentum, and he won four more games before Soyfer got his first, and last, of the set, dropping the final two games for the 1-6, 6-2, 6-1 result. Thursday Oh will play unseeded Jay Min of the US, who beat a No. 9 seed, Kenneth Raisma of Estonia, 6-1, 7-5 today. Mmoh and Min are two of five US boys in the round of 16. The others are: Nathan Ponwith, the No. 3 seed, unseeded Zeke Clark and qualifier Gui Gomes. Ponwith defeated qualifier Dennis Afanasev of the US 6-3, 6-2; Clark beat No. 7 seed Evan Zhu of the US 2-6, 6-1, 7-5, and Gomes ousted Gianni Ross of the US, a No. 9 seed, 6-2, 7-5. In the boys 12s, half of the 16 remaining are from the US: unseeded Brian Shi, Blake Croyder, Jenson Brooksby and Matthew Fenty and No. 1 seeds Keenan Mayo, Andrew Fenty, Boris Kozlov and Roscoe Bellamy. Croyder and Brooksby and Kozlov and Bellamy play each other in Thursday's fourth round. It was a rough day for the Russians, with Eddie Herr champion Alen Avidzba unable to take the court against Matthew Fenty due to cramps, and Nikolay Vylegzhanin, the Eddie Herr finalist, falling to qualifier Yeongseok Jeong of Korea 6-4, 3-6, 7-5. Vylegzhanin took the loss hard, staggering to the net to shake hands as if in physical pain and sobbing uncontrollably on the bench for several minutes afterwards. There were plenty of surprises in Wednesday's third round at the girls 14s at Key Biscayne, with No. 3 seed Jazzi Plews of Great Britain and Nicole Frenkel and Usue Arconada of the US, both No. 9 seeds, losing. There are seven US girls in the round of 16: Jaeda Daniel(17), Claire Liu(17), Emma Higuchi(4), CC Bellis(9), Alexis Nelson(9), Sofia Kenin(6) and Jada Hart(17). Higuchi and Bellis and Nelson and Kenin play each other on Thursday. In the girls 12s, there are five US girls in the round of 16, including two qualifiers: Nada Dimovska and Ulyana Shirokova. No. 1 seeds Abigail Desiatnikov and Eddie Herr champion Ellie Douglas are in the top half, as is unseeded Rachel Lim. I spent the day watching the girls 14s second round at Crandon Park today, the site of the Sony Open, and the former site of the 16s and 18s Orange Bowl. It didn't take me long to recall why I liked the site: all matches chaired, easy to photograph every court, and why I didn't: courts too far apart to generate any excitement and nasty, stealthy bugs. But the weather was pleasant, with partly cloudy skies, a slight breeze, and temperatures in the the low 80s, so I began to check out players I knew, and others who were just names in draws to me. The first court I happened upon was court 1, where top seed Dalma Galfi of Hungary was trailing Nadia Gizdova of the US 5-2. Gizdova closed out the first set 6-2, with Galfi missing more balls than she made, most of the them into the net. Gizdova, who trains at the Junior Tennis Champions Center in College Park Maryland, served for the match in the second set at 5-2, but was unable to get to match point. Galfi was still making unforced errors, but not as frequently, and she held for 5-4. Gizdova served for the match again, and started well, getting all her first serves in to take a 40-15 lead, and she had to chances for the upset. On the first match point, Galfi pounded a backhand winner down the line. On the second, Gizdova double faulted, and two errors later, Galfi had evened the match. The top seed held again, then was up 0-40 on Gizdova's serve at 5-6, but Gizdova saved all three set points in that game to force a second set tiebreaker. There weren't many winners in the tiebreaker, but it was extremely close. Galfi missed an overhead badly, standing within five feet of the net, making it 5-4, but although Gizdova again had the match on her racquet, she lost both her serves, with two forehand errors giving Galfi another set point. Galfi thought she had hit an ace that the chair umpire, a beat late, called it long, and although she seemed agitated by the call, she refocused and hit a second serve ace to take the tiebreaker 7 points to 5. The third set was all Galfi, who left her poor play in the first set behind to record a 3-6, 7-6(5), 6-1 victory. No. 2 seed Aleksandra Pospelova of Russia had lost in the first round late Monday, but No. 3 seed Jazzi Plews of Great Britain and No. 4 seed Emma Higuchi of the United States had no difficulty advancing to the third round. Another tense and entertaining match ended with Angela Kulikov of the US, a 17 seed, defeating Martina Zerulo of Italy 6-3, 3-6, 7-5. Zerulo has style and variety in her game, leaving her opponent constantly guessing as to which shot she will use, but she was unable to serve out the match at 5-4, and Kulikov took advantage. She held serve for 6-5, then stayed steady as Zerulo began to feel the pressure and failed to execute her shots. Down 15-40, Zerulo saved one match point with a perfect volley winner, but on the second, Kulkov gave her a tough ball to handle at the net, and Zerulo couldn't react quickly enough, giving the 2012 14s USTA Clay Court finalist the victory. Kulikov is in a section of the draw that includes four Americans: Higuchi, Caroline Dolehide and CC Bellis, a No. 9 seed, whom Kulikov plays on Wednesday. Eddie Herr champion and No. 5 seed Fanni Stollar of Hungary advanced to the third round, as did the player she beat in the Eddie Herr final--Sofia Kenin of the US. Kenin, the No. 6 seed, defeated Constanza Gorches of Mexico 7-5, 6-4. In the boys 14s at the University of Miami, top seed Michael Mmoh of the US, No. 2 seed Chanyeong Oh of Korea, No. 3 seed Nathan Ponwith of the US and No. 4 seed Mikael Ymer of Sweden all made it through to the Wednesday's third round. In the girls 12s at the Biltmore Tennis Center, No. 1 seeds Abigail Desiatnikov and Ellie Douglas of US and Eddie Herr finalist Anastasia Potapova of Russia all advanced to the third round. The boys 12s at Salvadore Park saw US No. 1 seeds Roscoe Bellamy, Keenan Mayo, Andrew Fenty and Boris Kozlov advance to the third round in straight sets. Five qualifiers, two of them from Korea, have advanced to the final 32. It's not often that the underdog in a boys 12s match is a 6-foot left-hander who hits the cover off the ball. Technically, unseeded Chen-Jui Ho of Taiwan was David to No. 1 seed and Eddie Herr 12s champion Alen Avidzba of Russia's Goliath, but after watching a few points of their first round Junior Orange match Monday, it was impossible to frame the contest in those terms. Ho, who outweighs the slightly built Russian by at least 60 pounds, took the first set from Avidzba, who last week reached the final of the Nike Junior Tennis International Masters, 6-0, and rumors circulated as far away as the Boys 14s site at the University of Miami that Ho was on his way to victory. I had spend much of the day at the boys 12s site at Salvadore Park, but had gone to the University of Miami for a couple of hours in the afternoon. When I returned, Avidzba had taken the second set 6-4, and a third set was just beginning. As dusk began to settle in on the 3 p.m. match, Avidzba had obviously become more accustomed to the ferocious pace Ho could generate, and was mentally able to handle the frustration of being unable to come near a Ho shot if it landed anywhere close to a line. Avidzba played defense, but often he could prolong rallies long enough to produce a Ho error, although neither player was broken in the final set. Ho's serve was capable of bailing him out of any tight spots, and Avidzba's concentration rarely lagged as the third set continued. A small crowd had gathered near the fence around court 11, which was fortunately empty, giving a clearer view to the battle on court 12. Some of Ho's shots, including one massive overhead winner, drew giggles from the crowd, the only appropriate response to seeing such physical strength in that setting and peer group. Avidzba didn't trail in the tiebreaker, winning a tough first point on his serve. Hon hit an ace to make it 1-1, but Avidzba maneuvered Hon out of position several times to take a 4-2 lead at the change of ends. Hon hit another ace to make it 4-3, but a Hon backhand error and a forehand winner by Avidzba brought him three matches points. Avidzba converted on the first, with Hon's forehand going wide, and after the handshake, both players sat on the court--Avidzba fighting cramps and Ho collecting himself after losing a match he certainly could have won. While Avidzba survived the challenge, but three of the No. 1 seeds did not. Jenson Brooksby of the United States defeated No. 1 Naoki Tajima of Japan 4-6, 6-0, 6-3; Pedro Henrique Cordeiro of Brazil defeated No. 1 Cesar Cernuda Alonso of Spain 6-0, 6-2 and Patrick Sydow of the Netherlands defeated Bodan Zarkovic of Serbia 6-3, 6-1. 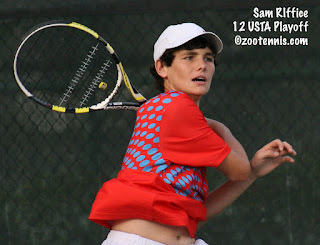 Of the 16 qualifiers who reached the boys 12s main draw, 11 advanced to the second round. Two of the seven lucky losers--William Grant of the US and Vinicius Nogueira of Brazil--also won their first round main draw matches Monday. The top four seeds in the boys 14s advanced to the second round without difficulty, with Michael Mmoh, Chan Yeong Oh of Korea, Nathan Ponwith and Mikael Ymer of Sweden advancing in straight sets. Madison Keys will be returning to the main draw of the Australian Open next month, while Rhyne Williams will be making his first trip after both posted victories today in the USTA Australian Open wild card playoff in Norcross, Georgia. 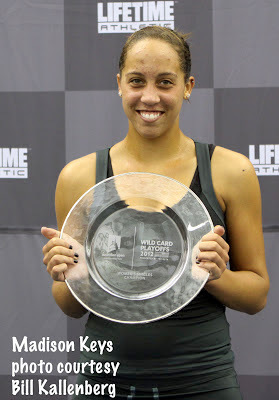 Seventeen-year-old Keys, who won the same tournament last year, beat 2012 NCAA finalist Mallory Burdette of Stanford 7-5, 6-3 in the women's final. The 21-year-old Williams, a 2011 NCAA finalist while at Tennessee, followed with a 7-6(4), 5-7, 6-3, 6-3 victory over Tim Smyczek, the top seed, to take the men's wild card. For complete coverage of Williams' win, see Amanda Pruitt's article at utsports.com. For more on Keys' victory, see Steve Fogleman's post at Tennis East Coast. Thanks to Bill Kallenberg for providing the photos of the two champions. I drove across the state and back today to attend the USTA luncheon and Town Hall meeting at the ITA Coaches Convention in Naples, FL. I was invited to attend by the USTA's Bill Mountford, who had initially signed on to present to the college coaches about the 10-and-under tennis initiative, but when the October Tennis Industry meeting in Chicago resulted in the scheduling of Town Hall meetings and a listening tour to discuss the upcoming Junior Competition changes, that presentation was truncated, with more time allotted for questions for about junior competition changes. In attendance for the USTA were Mountford and outgoing president Jon Vegosen, who were on the podium, and Junior Competition committee member and now chairperson Andrea Norman and USTA Junior Competition Director Lew Brewer at a front table, who were available for questions. Vegosen explained the philosophy behind the changes, emphasizing the need to have more local tennis opportunities for young people when they begin exploring all the youth sports available to them. The coaches received a one-page "CliffNotes" version of the document, with the 2014 schedule as proposed, but there was definitely a wide range of awareness and understanding of the new structure. Several coaches voiced support of the concept of returning to sectional play, saying the value of those tournaments to them has decreased with some of the best players not playing in them. There was a comment about the size of the four regions for the new regionals and the travel required (Minnesota to Texas in this particular case), but I didn't detect from Norman any sense this might be altered. 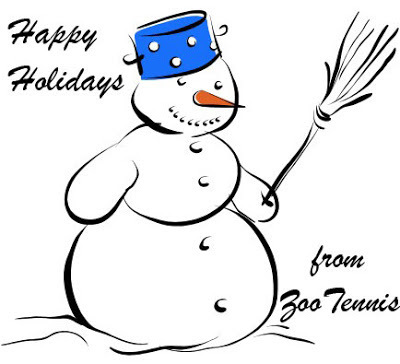 As those of you who read zootennis regularly know, I have been studying the changes as they've been presented in the nine-page document the USTA has released for many months, and have followed many of the blogs and forums that have delved into the issue. I don't claim to understand how it will all work, but I do find the notion that every player(save wild cards) who qualify for the two gold ball Nationals remaining--the Clays and Hard Courts--must come from sectional endorsements. There is no other way in. It may result in the best players in the United States playing sectionals again, or it may result in the best players skipping the nationals, playing ITFs instead. I made only two comments during the meeting, the first to point out that as long as the ITF path exists in the United States (and every other country in the world, more or less) and it potentially leads to the US Open Junior Championships, some players will take that option, rather than the one the USTA provides. As USC coach Peter Smith said about this, "the cat's out of the bag," and no structure the USTA sets up can reverse that change in junior tennis. David Roditi of TCU, who was a National Coach for the USTA before he returned to coach the men's team at his alma mater, asked if these changes may mean two separate paths: one to the US Open Juniors and one to the USTA Nationals. He mentioned that good players skip the national tournaments in Mexico, opting instead for ITF events, and while there are obviously big differences in the two countries and their federations, it is a point worth considering. Now players can do both, but will the elimination of the national standing list force them to choose one or the other? This led to a wild card discussion, and 16 wild cards is the number set aside for the 128 draws in the boys and girls 18s. Peter Wright of Cal asked if those might be tied to some sort of qualification system, as the ITA does for its wild cards or at-large selections. As for the 128 draws themselves, a few coaches were for them, seeing in the 192-draws a number of players not of college quality; a few agreed that a qualifying event prior to the two remaining nationals would be a good solution, and Vegosen said that is being considered. I've always thought qualifiers a dependable and easy-to-understand part of tennis, so I am hopeful this will happen, but that brings me to my second comment at the luncheon. It wasn't really a comment, but a question. I wanted to know how the coaches felt about the demise of the Winter Nationals, or rather, the metamorphosis of it to a team event. I'm not sure how many coaches had absorbed this change prior to the luncheon, but Shelia McInerney of Arizona State said she liked team events, citing the August 18s Team championships and their format. Peter Smith suggested the 64 players involved in the Winter Nationals (with the "waterfalls") were too few to justify the expense of a recruiting trip and suggested more team events in the younger age divisions, saying the 12s zonals always are at the top of his college players' favorite tournaments list. Mountford made sure that those coaches who didn't speak to the issues raised during the 90-minute meeting (and I just touched on a few) had an option to contact him privately later, and he also encouraged everyone to use the email account letusknow@usta.com for further, private feedback and suggestions. The ITA will be sending links to the USTA's one-page and nine-page documents to its members following the meeting to help raise awareness among the coaches. It's my perception that he monitors this account himself and will use it to help quantify the support for the tweaks being considered. I do not think the plan, voted and approved in March of this year, will be scrapped. The USTA appears to be committed to its philosophy and its implementation, and that includes the sections (save Southern, perhaps). But I think if enough people take the time to understand the new structure and comment on what they would like to see changed in it, the USTA will take those emails seriously. If they don't hear from those affected, they will presume agreement with the changes that will be implemented in 2014. Lisa Stone's Parenting Aces blog is a great resource for finding out more about the changes. She has a recent recap of her conversation with Bill Mountford as well as other information on the reduction of national opportunities this month. See her 2014 junior comp info page for all of the articles she has posted on the subject. The finals of the USTA's Australian Open wild card tournament are set for Sunday with Madison Keys and Mallory Burdette playing for the women's wild card and Tim Smyczek and Rhyne Williams playing for the men's. No. 3 seed Keys, who won the wild card tournament in Norcross Georgia last year, beat No. 2 seed Alexa Glatch 6-0, 6-1 in the semifinals while No. 4 seed Burdette defeated Grace Min 6-2, 7-6(7). Keys and Burdette played this fall at the Lexington Challenger with Keys winning 6-3, 6-0, but despite the 17-year-old's great form this weekend, I would expect a closer match in Sunday's final. For more on the women's semifinal, see the Tennis East Coast blog. The top-seeded Smyczek, who only received his invitation after Jack Sock and Steve Johnson dropped out, defeated No. 4 seed Tennys Sandgren 6-2, 6-2. There will be one former Tennessee Volunteer in the final however, with No. 3 seed Williams coming back against second seed Denis Kudla for a 5-7, 7-6(4), 6-1 victory. Kudla served for the match at 5-3 in the second set. For more on Williams' victory, see this article at utsports.com. In other Australian Open wild card news, former Cal Bear Bojana Bobusic won the Tennis Australia tournament for a main draw wild card. Bobusic defeated Monique Adamczak 6-1, 6-3. Ben Mitchell and Matt Reid will decide the men's wild card later this evening. I spent the afternoon and evening at the Junior Orange Bowl boys 12s qualifying, which drew a bigger crowd than usual, due to the Har-Tru courts. Several rain showers, which were not in the forecast Friday night, delayed play on the hard courts of Key Biscayne (Girls 14s), Biltmore Tennis Center(Girls 12s) and the University of Miami (Boys 14s). So few matches were played at Miami courts that there will be short scoring for two round of matches there on Sunday. The boys 12s are on schedule, and although they were still playing at the other two hard court sites this evening, those schedules also have not changed for Sunday. With such big qualifying draws and only seven days to complete the 128-player main draw tournament, even the slightest bit of rain early in the tournament leads to major scheduling headaches. The draws will not be available until Sunday after main draw registration, but the seeds are published and can be viewed by the drop down menu under the competitor tab at the TennisLink site. 2010 12s champion Michael Mmoh is the top seed in the boys 14s and Dalmi Galfi of Hungary is the top seed in the girls 14s. As is their custom, the seeding committee has designated 16 No. 1 seeds in the boys and girls 12s. I will be at the USTA Town Hall meeting at the ITA convention in Naples on Sunday, so I will not be attending the final round of qualifying (or maybe I will, if it is carried over to Monday). My recap of last week's Orange Bowl is available now at the Tennis Recruiting Network. It's always good to the recap, slideshow and videos from one tournament done before another one starts. 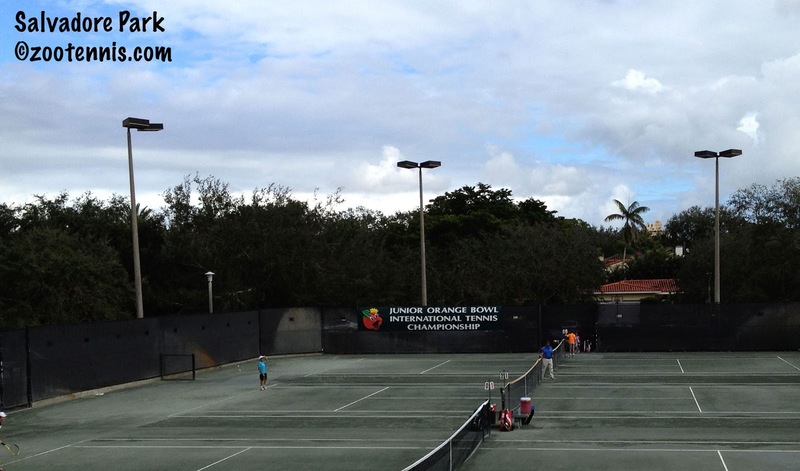 Monday the main draw of the Junior Orange Bowl begins, and draws will be at the TennisLink site. The hotel internet cooperated today, so there are videos of all eight champions and finalists available on YouTube. The champions' videos are below, the finalists' videos can be accessed by clicking on their names. Cohen plays Min, Glatch plays Riske, Keys plays Mattek-Sands and Falconi plays Burdette. Smyczek plays Harrison, Kudla plays Buchanan, Williams plays Kosakowski and Sandgren plays Klahn. There is also an exhibition featuring the Bryan Brothers scheduled for Friday afternoon. Friday's match times are available at the tournament website. Parenting Aces' Lisa Stone will be at the tournament, as will a reporter for Tennis East Coast. Amanda Pruitt, the men's tennis SID at Tennessee, will also be in Atlanta for the event. Speaking of Parenting Aces, Lisa has written a post about the new Tennis Recruiting Network initiative--National Showcase Series. TRN has organized USTA-sanctioned tournaments open to every junior in the country, which will count toward TRN rankings. They will not count toward USTA rankings unless the player is a resident of the district or section where they are held. 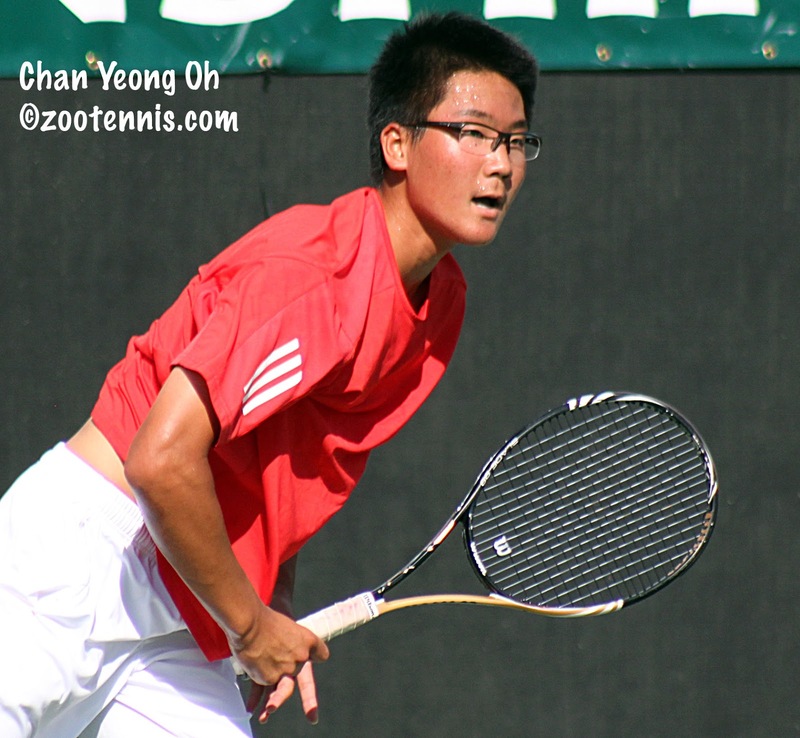 The first tournament is for boys and girls 18s in Costa Mesa, California on December 26. It's an exciting innovation that's bolstered by the high regard college coaches have for the Tennis Recruiting Network's rankings, and leveraging that regard has led to more opportunities for juniors competition in 2013. 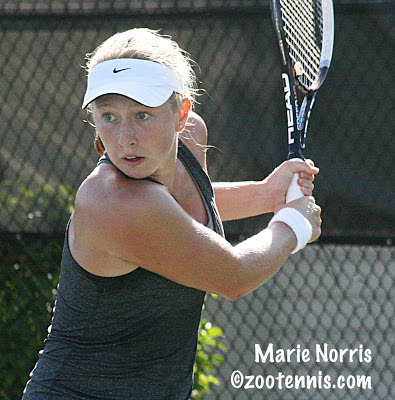 The Tennis Space has published two brief question and answer sessions with newly crowned ITF world junior champions Taylor Townsend of the US and Filip Peliwo of Canada. Townsend's responses are here, and Peliwo's are here. I spoke to Townsend many times last week in the Orange Bowl and wasn't able to use all the material she gave me, but I did want to pass along her answer to the question I asked her after her loss to Ana Konjuh in the semifinals. Townsend reached the quarterfinals of both a $25,000 and a $75,000 Pro Circuit tournament this fall, so she had recent experience with the level Konjuh was playing at this month, and I asked her what she had taken from her loss to Konjuh. "That match taught me a lot of different things I need to work on, especially against players like her," Townsend said. "People that are on the pro circuit, they hit the ball like her, and even bigger. It taught me a few things I need to tweak and work on so that I can hang with people, and allow myself to play my game against people who hit that hard." There are two $25,000 Pro Circuit events in Florida next month that Townsend is expecting to play, and since she played so few pro events in 2012, she is unlikely to reach her limit of 12 (plus merited increases) before April. Sam Riffice and Noah Makarome have earned two of the four places on the USTA 14-and-under team that will travel to Europe next month with wins today at the National Training Center in Boca Raton. Makarome defeated Gianni Ross 2-6, 6-2, 6-0 and Riffice beat Patrick Kypson 6-1, 6-2 in today's final matches. Alex del Corral, Vasil Kirkov, Roscoe Bellamy and Sangeet Sridhar. Two more players will be selected for the team in the next week or so. The Nike Junior Tour International Masters was completed on Tuesday in Port St. Lucie, with 2011 Junior Orange Bowl champion Claire Liu capturing the Girls 12s title. Liu, the No. 6 seed, beat No. 4 seed Abigail Desiatnikov, also of the United States 6-1, 6-0. Liu will be playing the 14s at the upcoming Junior Orange Bowl. Due to light rain, both 14s finals and the girls 12s final were moved to clay courts, with the boys 12s always scheduled to be played on clay. This article on the tournament website explains the various stages of the finals when they were moved onto clay courts. In the boys 12s final, Rudolf Molleker of Germany avenged his semifinal loss in the Eddie Herr to Alen Avidzba of Russia by a score of 6-4, 6-0. Avidzba was the No. 1 seed, with Molleker seeded No. 3. 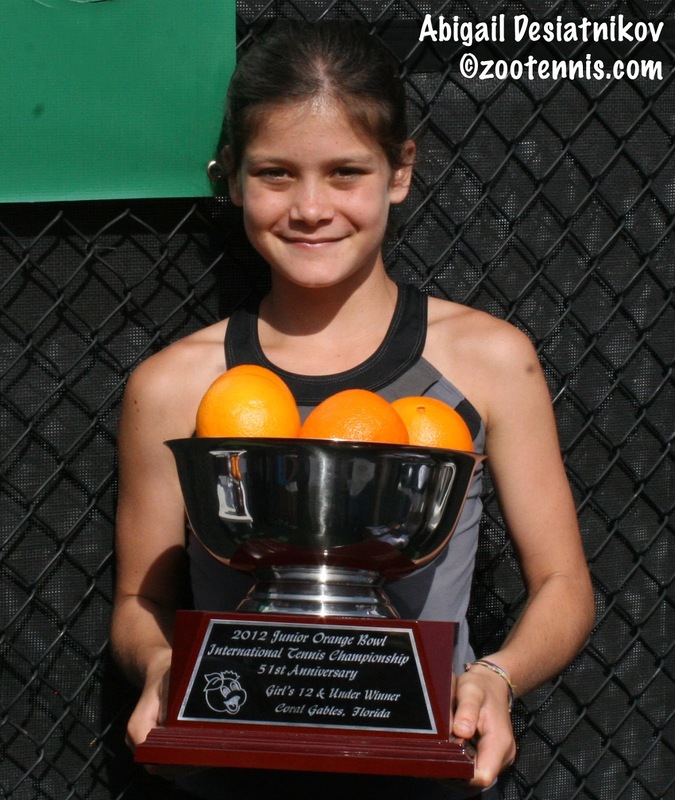 Unseeded Katerina Jokic of Serbia, who won the Eddie Herr 12s in 2010, took the girls 14s final, beating No. 6 seed Julia Payola of Spain 6-2, 6-4. Payola, who did not play the Eddie Herr, beat No. 1 seed and Eddie Herr 14s champion Fanni Stollar of Hungary in the quarterfinals. Eddie Herr finalist Sofia Kenin of the US lost to Jokic in the third round. The boys 14s title went to unseeded Mate Valkusz of Hungary, who beat No. 2 seed Jay Clarke of Great Britain 3-6, 6-3, 6-4 in the final. For links to the complete draws, see the home page of the tournament website.